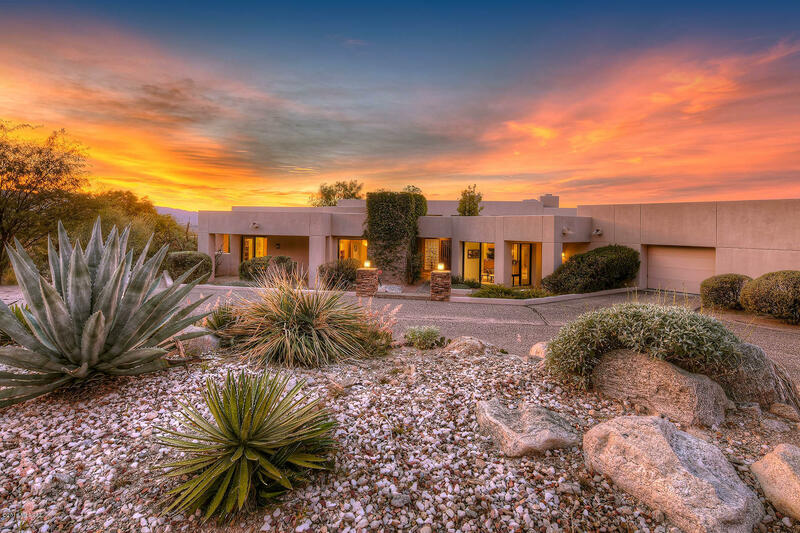 Seller will accept or counter offers from $1,050,00 to$1,175,000 for this OUTSTANDING CONTEMPORARYWITH AWESOME CITY, MOUNTAIN, SUNSET+DESERT VIEWS!! VERY PRIVATE SETTING IN GATED CANYON VIEW ESTATES. ARCHITECT DESIGNED! WINDOW WALLS BRING THE OUTSIDE IN. MASONRY/STUCCO CONSTRUCTION. STUNNING FORMAL LR+DR ARE SEPARATED BY SPLIT FACED BLOCK FIREPLACE WALL-ROOM FOR MANY COOKS IN THE GOURMET KITCHEN, BREAKFAST NOOK W/MT. VIEWS! . LUXURY MASTER SUITE HIS/HER BATHS+SITTING AREA- LIBRARY/OFFICE, TOO! Main portion of the home is appx 4382 sqft on ONE LEVEL..Wonderful family room/media/game room w/ bar area is 1097+- sqft. See floor plan in Documents.1 listing agent related to Seller. PEBBLE TECH POOL OVERLOOKS THE CANYON. 5 COVERED PATIOS-FABULOUS 3+ GARAGE AND STORAGE--EXCEPTIONAL!! !